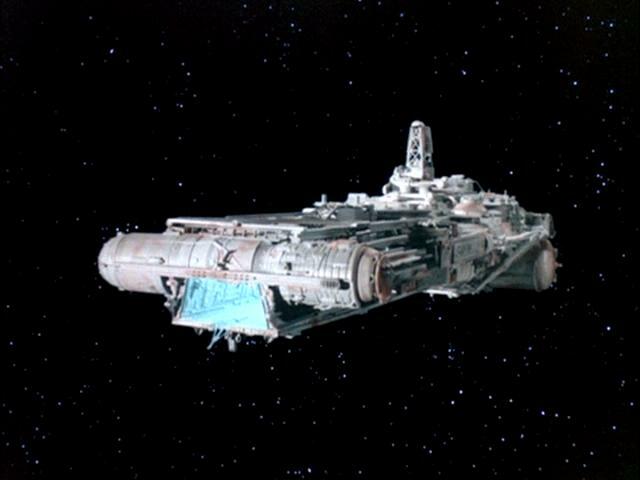 The Cylon super-basestar launches a massive attack against the fleet and Apollo is forced to make a desperate command decision. As the Cylon attack against the fleet continues, all looks hopeless, even as all active pilots and reservists have been deployed. Adama and Tigh jump into a pair of Vipers themselves, leaving Apollo and Athena in charge of the overall battle. Sephoni enters C&C and tells Apollo she has psionically detected a weakness in the shielding of the super-basestar that may allow a fusion missile to take it out. But the Cylons are jamming all fleet communications and countermeasures aren't working, so they are unable to notify their pilots. Apollo leaves Athena in command and hops into a Viper, launching himself into the fray. 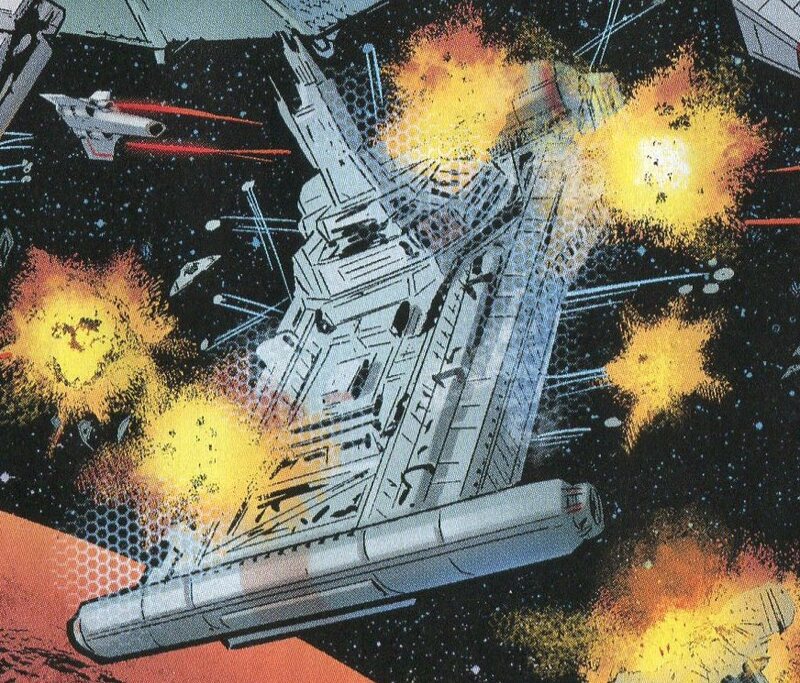 Communications soon return, but the other Vipers have used up their fusion missiles, so Apollo goes in for the run and the missile strikes true, destroying the basestar in a violent explosion. Apollo emerges from the blast seemingly unscathed, but then reports that his stick is jammed. Starbuck keeps shouting over the comm for him to pull out as the Viper plunges toward a nearby sun and Apollo is gone. Aboard the Galactica, Xam also seems to receive a message of his loss, typing out "Gone" over-and-over on his medtube touchpad. Later, Commander Adama leads a memorial to his son, vowing to find the planet Earth in his name. Apollo's death in this issue, 10 yahrens into the fleet's exodus from the Colonies, of course conflicts with his presence in stories set after this time period, specifically the Richard Hatch novels beginning with Armageddon and the various Maximum Press comic book mini-series beginning with War of Eden. On the other hand, it's not impossible to imagine that Apollo may have survived his seeming death here through the intervention of the Beings of Light (though there is no indication of that in this story). On page 1, Apollo communicates with a ship of the fleet called the Atrius. Also on page 1, Athena remarks on the destruction of the Taurus Axillon. This brings the fleet down to 210 ships from the last-assumed 211 in "The Death of Apollo" Part 1. Athena tells one of the Viper formations to cover a ship called the Raxis on page 1. On page 2, the middle structure of the super-basestar looks like a standard basestar. On page 2, the Celestra appears to be coming under heavy fire. The Celestra previously appeared in "Take the Celestra". 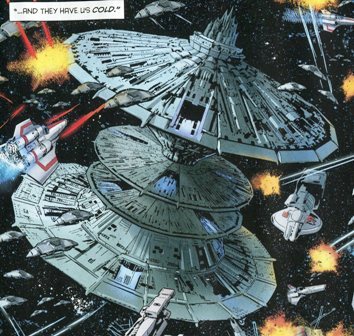 On page 3, notice a fleet ship in the upper-right corner that appears to have a head of a battlestar, but with a different body. On page 5, Omega reports there are sixteen Vipers still held in reserve, but they are mostly hangar queens. "Hangar queen" is a term used to describe a grounded aircraft that is kept around only for parts or a craft that seems to spend more time in maintenance than flight. Tigh and Adama hop into some spare Vipers to aid in the battle against the Cylons. Adama was an adept pilot in his youth and last manned the helm of a Viper in Apollo's War. Sephoni's discovery of a vulnerability in the super-basestar's shielding overlap which would allow a well-placed fusion missile to destroy it may be a nod by the writer to Star Wars: A New Hope and the Death Star's similar vulnerability due to an unshielded thermal exhaust port. On page 12, the joystick in Apollo's Viper has a red middle button labeled "Missiles". Normally, this button is white and labeled "Turbo", with the leftmost button colored red and labeled "Fire". Apollo seemingly dies as his out-of-control Viper plunges into a nearby sun during the battle against the forces of the super-basestar, but not before he has managed to destroy the basestar itself, saving the fleet. It we take his death here as gospel, this negates his appearances in later stories from other publishers. The issue ends, "In memory, Glen A. Larson, 1937-2014." Larson, of course, was the creator of Battlestar Galactica. He died in November 2014, shortly before this mini-series began publication. Did Apollo commit suicide? On page 19 his Viper has emerged apparently fully intact from the explosion of the super-basestar, but he claims in his communication with Starbuck that his stick is jammed. Yet, we do not seem struggling with it; if anything it looks as if he just lets go. And even if his stick was jammed, what are the odds that the ship just happened to be headed in the direction of a nearby sun? Plus, as Starbuck keeps shouting through his comm for Apollo to pull out of the dive, Apollo doesn't even respond further. He just seems to be staring acceptingly into his fate. We saw in "The Death of Apollo" Part 5 that he was not at all happy with having to sit out the rest of the war outside of a Viper cockpit due to his brain injury. It's also possible that the physical stress of his actions piloting the Viper brought on a stroke due to the microfissure injury in his brain, leaving him unable to control the craft or respond to Starbuck's communications. Is Apollo really dead? Conveniently, there is no body. Since his Viper plunged into a sun, that seems pretty final, but might the Beings of Light have intervened as they have a time or two in the past (and future)?